Sågarbo Herrgård Stuguthyrning – Sågarbo Manor Cabin Rentals – is located on the Sågarbofjärden Bay on the Bothnian Sea. Together with the lower Dalälven River our coastline offers superb opportunities for catching large sea trout, pike and salmon. This is a very lovely landscape wholly suitable for shore fishing, but also by boat or belly float. We can extend it to you through our collaboration with professional fishing guides. 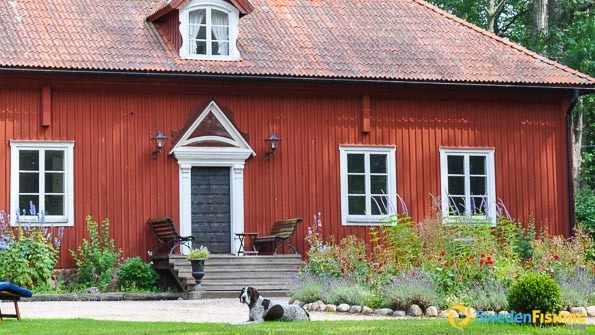 At Sågarbo Manor we speak Swedish, English and German with our guests. Our facilities are open from April through October. Trout – spring in April/May, autumn in October. Pike – spring in April/May, autumn in September/October. Salmon – summer in June/July. Perch – spring in May, summer in June through August. Amusement and animal zoo are found at the Furuvik Park only 10 minutes by car from Sågarbo. Try your hand at black smithing, riding, golf and paddling, all within 5 km. Enjoy the setting – we rent out bicycles. The Sågarbo Manor manor was built in the late 1600s. It was originally called the Anckarström Estate, named for Johan Jacob Anckarström who assassinated King Gustav III at the masked ball in Stockholm 1792. The most common species in our waters are trout, pike, salmon and perch. Records; Trout – 10.0 kg (2009). Salmon – 27.97 kg (1996). Pike – 15.2 kg (2009). To get the best of our fishing opportunities you should book one of our professional guides; the price includes lunch, break and all fishing equipment. The guiding is done either on a Tracker Pro Guide V16 SC, 90 hp Mercury or a Ryds 485 RSI, 50 hp Mercury 4-stroke. Both boats have fish finder and GPS, electric motors and safety equipment. You can catch nice sea trout along the coast using both fly and spin fishing. The landscape is perfect for shore fishing, but fishing in a boat or float tube is naturally excellent as well – both on offer through our collaboration with professional fishing guides. 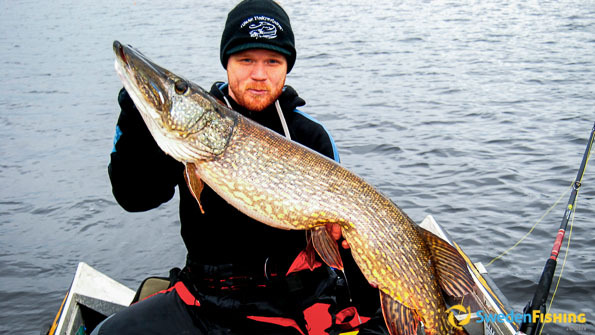 Pike is also fished with either fly or spin fishing. Salmon fishing is excellent in the lower sections of the Dalälven River. The sea fishing does not require a fishing licence even though there are rules regarding minimum and maximum sizes, as well as how many fish you may land per day. However, fishing in the river calls for a licence you can buy from our fishing guides or in a nearby fishing shop. While here you will live well in comfortable, winter-warm, newly renovated and cosy cottages measuring 30 m2 and offering shower/WC, well-equipped pantries with a stove, microwave oven, coffee maker and refrigerator. All cottages are furnished with two fully-sprung mattress beds and two extra beds, dining alcove and garden furniture. We arrange dinners for groups at the estate manor and it is possible to hire the kitchen for group cooking. The estate has lounge with cozy open fire place, kitchen and dinner room, hot tubs, sauna for hire, playgrounds, private beach, its own boat ramp, dock, reception, several grills and bicycles for hire. Bed linen and towels can be rented, a cot for the youngest and a warm welcome to four-legged guests! 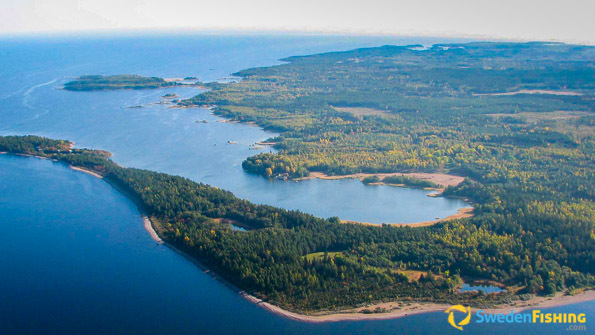 There is a 1 km trail that takes you to the Billudden Nature Preserve and the Rullsand shore for sea-bathing. Sågarbo Manor is located between Tierp and Gävle in Älvkarleby municipality in northernmost Uppland county. 23 km SO of Gävle. 210 km S of Sundsvall. 90 km NO of Uppsala. 170 km N of Stockholm. 2 km SO of the Dalälven River mouth into the Boltic Sea.